The HSM Securio B26c Level 4 Micro Cut Shredder is ideal for use in small businesses. Capable of shredding up to 11-13 sheets of paper, can create 2,116 cross-cut / confetti-cut particles per page, and has an 14.5-gallon capacity of waste bin. The HSM Securio B26c Level 4 Micro Cut Shredder is perfect for shredding of tax documents, bank statements, and medical bills. It can also shreds staples, paper clips, and credit/store cards. This shredder has a JamStop Anti-Jam Technology feature that prevents jams when machine is overloaded and can work continuously with no down time. Secure your documents and give yourself a peace of mind with this HSM Securio B26c Level 4 Micro Cut Shredder. Hello and welcome to MyBinding video. 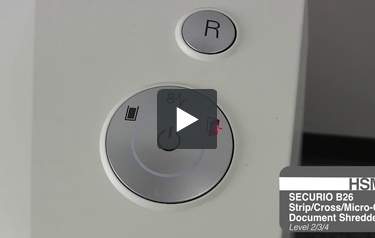 This video looks at the HSM SECURIO B26 shredder. With an LED touch-plate easy to use control panel, this shredder is ideal for small businesses. The mouth opening is at 11 inches wide so it handles most paper and it comes in strip, cross or micro cut shredding options. When it comes to shredding capacity, strip-cut is at 30, cross-cut 19 and micro-cut at 13 sheets of 20-pound paper in a single pass. CDs and DVDs go just great in strip and cross-cut models and all models can handle cardstock, paper, paperclips, staples, credit cards and laminated items. The motor and solid steel cutting rollers are made to last. Should you have a jam, the reverse button backs everything out, start again. The waste bin is accessed from the front and is 14.5 gallons in size. For security levels, strip-cut is 2, cross-cut 3 and micro-cut is level 4 security. It stands at 26.5 inches; it’s almost 60 pounds and rolls around on rollers to make it easy, even on carpet. There it is. That’s the HSM SECURIO B26. For more demos, reviews and how to’s, check out MyBinding.com.